One May afternoon not so long ago, I stood on a stage at my high school and gave my valedictory speech. 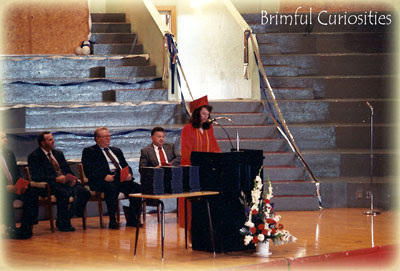 I honestly don't remember what I said, and it probably wasn't all that humorous, but I imagine I reflected on the past, talked about the future and tried to impart some sort of valuable advice to my fellow classmates. Most likely I was more concerned about not fainting while on stage in front of the entire community than anything else. "You've got your whole life ahead of you! Sometimes it'll be smooth sailing, but other times it'll be a bumpy ride, with many forks in the road." I doubt I told my classmates to "reach for the stars" but such sayings are often used occasions like graduations and other milestones. Author/Illustrator Serge Bloch recently released a humorous and inspirational little picture book that playful expands upon some familiar idioms and offers some lighthearted advice. His line style drawings coupled with photographed objects depict a small boy and a dog as they depart on a life journey. They make a splash, end up in the doghouse, and even have a change of heart but still manage to spread their wings and soar into the star-filled sky with smiles on their faces. It's a cute book and makes a perfect gift for graduates or anyone starting life anew. There's plenty of white space on the pages, so I also think the book would work wonderfully as a guest book journal where party guests could sign-in with their own messages and words of wisdom for the new graduate. Wouldn't that make a great and memorable keepsake? Now I just wish I knew someone graduating this year. Guess I'll just have to use the picture book to teach my preschooler about idioms and maybe someday she'll be the one on stage delivering a speech! 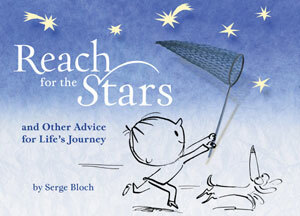 Thanks to Sterling Children's Books, I have an extra copy of Reach for the Stars: and Other Advice for Life's Journey to giveaway to a Brimful Curiosities reader. • Contest ends on Monday, May 24th, 2010 at 11:59 PM CST. Ohhhh - pick me!!! :-) Thanks!! This sounds like a great book to have. As a high school teacher, it would be a problem as to who should receive this book. So, I guess that I would have to keep it for myself as it looks like something that I would really enjoy. my husband is going through some mental health issue right now and could use some encouragement. He'd like this book. My husband calls me a bit of a Pollyanna, but I am all about the positive affirmations. I have three kids and I strive to teach them that perception is everything...Negative energy is waste of time. This sounds like a wonderful book, thanks. Looks like a wonderful book, thanks for the chance! Reminds me of the Dr Seuss book, looks very uplifting! This would be a magnificent graduation gift! This sounds like a great book to give to anyone who's going through a major life transformation! This book sounds very interesting. Thanks for the great contest!